When is the media ever going to quit criticizing President Trump and his family! Although Trump deserves some of the negative criticism he receives, he, nor his family, deserve criticism on every single issue they’re involved with day-to-day. I have not heard one major network, ABC, NBC, CBS compliment President Trump on a single issue from the beginning of his presidency until today! 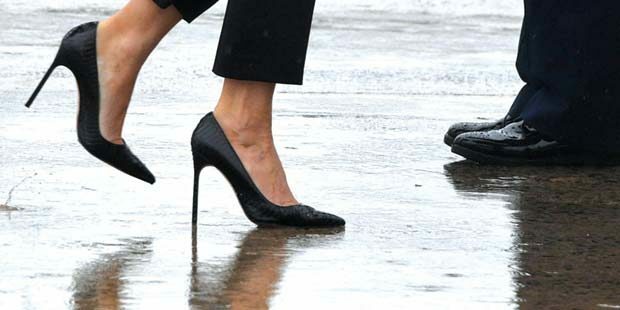 On his flight to the catastrophic flooding of Houston, the press criticized the president’s wife Melania for wearing high-heeled shoes when boarding the presidential plane, Air Force One. What the hell does the president’s wife’s shoes have anything to do with anything at all? The media continually searches for anything, no matter how trivial or of absolutely no substance at all, so they can belittle the president and his family. The media has shown complete contempt, not just for the president but for the presidential office as well. Let me ask whoever is reading this article a simple question. Were race relations as bad as they are today 15 years ago? If the answer is no then who, or what’s, to blame? Who is the culprit? Is it the Republicans or is it the Democrats or is it President Trump or does President Obama share some of the blame? In my opinion the Democrats have tried to split this country apart in order to gain a greater share of the popular vote. Whether it’s whites, blacks, Hispanics, gays, or lesbians the Democrats seem to have no other agenda than to use hate and fear to separate Americans. Whether it’s lower-cost healthcare, lower taxes, or illegal immigration (take note “ILLEGAL” immigration) the Democrats are blocking every Republican proposal with total disregard for the well being of every American citizen. I cannot think of one single thing the Democrats have proposed to make America great again. We must remember half of all Americans voted for President Trump, and in spite of the media, the false news and the fake polls, I believe the majority of good people in the United States want to see our president and our country not just survive but thrive!